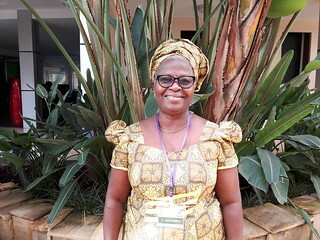 Adebambo Olufunmilayo, co-principal investigator for the African Chicken Genetic Gains (ACGG) project in Nigeria, incumbent director of the Biotechnology Centre and project leader at the Federal University of Agriculture, Abeokuta (FUNAAB), introduces herself and her work with the program. It is one of a series of portraits of key people in ACGG. Adebambo Olufunmilayo (photo credit: ILRI). I have a BSc degree in animal science and a PhD in animal breeding and genetics from the Premier University of Ibadan. I started my academic career as an agricultural demonstrator before working for 16 years with the Institute of Agricultural Research and Training, Obafemi Awolowo University in Nigeria, in the development of improved indigenous pig breeds for commercialization. I was the first female professor and head of the Department of Animal Breeding and Genetics and Dean of the College of Animal Science and Livestock Production at FUNAAB. I have served as a member in the governing council of the Federal University of Agriculture in Abeokuta, a visiting scholar at the Roslin Institute, Scotland and visiting professor at the Poultry Breeding Research Institute, Hessaraghata, India and the Ohio State University, USA. I have also contributed to various other national animal production activities in Nigeria. Currently, I am leading a project on the development of improved indigenous chicken and indigenous broilers for rural producers in Nigeria, in which I have worked for the past 20 years. I have trained several undergraduate and postgraduate students on pigs and poultry breeding and production. My major interest is in empowering women and youths in poverty alleviation and job creation using the FUNAAB alpha poultry breeds. I enjoy assisting local farmers in establishing pig farms, and organizing and coordinating short-term farmers training on pigs and poultry production. I am one of the co-principal investigators for ACGG in Nigeria. I am working on the multiplication of the FUNAAB-alpha lines, which is funded by the Bill & Melinda Gates Foundation (BMGF) as one of the 2014 PEARL projects for indigenous chicken development in the country. I am currently comparing the FUNAAB alpha with the exotic but locally-adapted ‘Shika Brown’ breed. As part of working with ACGG, other tropically adapted breeds will be included in the on-station testing at the FUNAAB Pearl Centre in addition to on-farm testing for eventual multiplication and distribution of preferred strains to Nigeria’s farmers. I am doing the genomic evaluation of our improved strains to understand their disease resistance. This will help in the moving to the field stage so that we can begin to empower our women, youth and retirees using improved indigenous chicken lines as pullets, dual-purpose and meat lines. 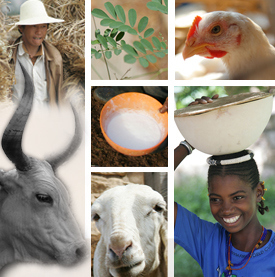 This is the first time that both the International Livestock Research Institute (ILRI) and BMGF are coming together to empower our rural people with what they can easily handle, which is unprecedented. My students, my co-scientists and I are very excited. We are really looking forward to adding the ACGG lines of tropically adapted strains from other countries. In Nigeria, we are still limited in the economic empowerment of the rural poor, so it is great that the youth can own and which can also assist retirees to get income. Chicken is the animal of the rural poor and millions of households in Nigeria have at one time or other kept some in their backyards. So, it is a welcomed proposition to help them improve on their chicken production practices so they can move from, for example, being 2–10 chickens seasonal producers to 30–50 small-scale producers and possibly to medium-scale producers keeping 100–200 chickens. What about the project causes concern for you and how could these be addressed? I am concerned that the strains introduced from other African countries may bring new diseases because as you import good genes of production, you are also importing bad genes of disease that may not be recognized yet in the source countries in addition to the challenges of adaptability of the imported varieties. But we are monitoring the disease aspect of the importation to prevent new diseases from coming into the country. I hope and believe we shall be able to manage these challenges as breeders and producers, holding on to the good genes even where we may not been able to completely eliminate the bad ones in the flock. As breeders, we believe that any attempt to eliminate bad genes or what we call genetic junks will also tamper with the good genes or eliminate them too. The project will encourage chicken production and improved nutrition among the rural households, and most essentially it is expected to economically empower and bring the rural poor, youths and retirees in my country out of poverty. I am really praying that the outcomes of this project go on well after it closes so that we can have a sustainable intervention that makes us proud that we were able to contribute tangibly to the health and social well-being of rural people in the countries ACGG is working in. Tags: Adebambo Olufunmilayo, voices. Bookmark the permalink. Everything said the way it is. I wish ‘Mama’ and her team a huge success in her efforts at making the FUNAAB Alphas available for the Project.